Downtown New Jersey is an organization of individuals, businesses, government agencies, and local and regional organizations that are passionate about downtowns. Count on us as your resource for anything regarding the vitality of our downtowns in New Jersey! To learn more about membership and its benefits, visit our Membership area. 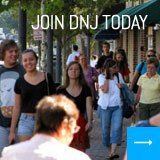 Click here and sign up to stay in touch with Downtown New Jersey's E-Newsletter.